The Firefly Light Hat | OhGizmo! By David Ponce on 10/04/05 • Leave a comment! You have to admire a good idea and a pointy hat. While this is still at the conceptual stages, I’m rooting that it actually sees production. It’s the “Firefly Light Hat”. It’s designed by Fabian Monslave is apparently aimed at Asian societies that use groovy such head-wear. It sports three photovoltaic cells that gather electricity during the day. When the wearer comes home at sunset, he only has to remove the hat, put it on a pole, and an integrated LED bulb provides lighting for the rest of the night, just like that. It is being developed in association with Ignite Innovations to provide electric light for rural unelectrified villages in Southeast Asia by using solar technologies. 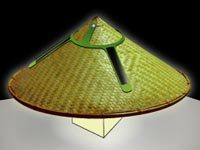 The hat would replace existing kerosene lamps, which are uneconomical and harmful to users. Read more about it here. Story VIA Yanko Design.